Intense Pure Air is the only purifier to filter up to 99.97% of pollution and definitively destroy formaldehyde, the most harmful pollutant in our homes. Suitable for small rooms, this purifier combines performance, comfort and convenience thanks to its automatic and night modes. *MSRP, not minimum, not obligatory. The pre-filter intercepts the largest pollutants such as hair, dust and animal fur. The high performance HEPA filter is for finer particles (PM2.5) such as acarids, pollens, animal allergens, bacteria, mold, etc. The combined action of these 4 filters allows up to 99.97% of the finest and most difficult to filter particles to be captured. The filter gradually changes colour, from light yellow to dark brown, according to the level of saturation. In auto mode, the Intense Pure Air purifer automatically adapts its filtration according to the level of pollution detected using the integrated particle sensor and 4 filtration speeds. Use with a sound level of just 22 dB(A) in position 1, and 45 dB(A) on the maximum setting, for peace of mind both day and night. In NIGHT mode, Intense Pure Air has an automatic mode to gaurantee purified air and preserved sleep. Set to speed 1, its quietest speed, it will automatically adjust to speed 2 if it detects pollution in the air. It therefore combines purified air with a calm and silent night. *Acoustic pressure measured at 4 ft 11in from the air purifier in a semi-anechoic chamber. 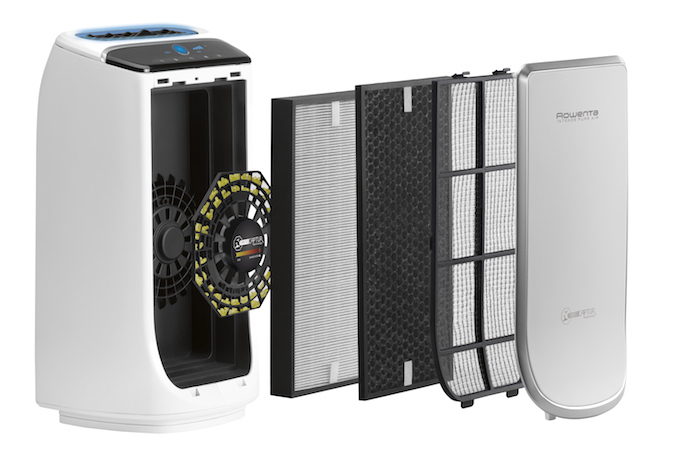 WITH ITS EXTREMELY HIGH PERFORMANCE, INTENSE PURE AIR PURIFIES SMALL ROOMS IN RECORD TIME. 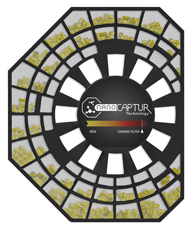 *CADR is a measurement that allows us to quantify how fast a purifier is able to remove the particles present in the room. 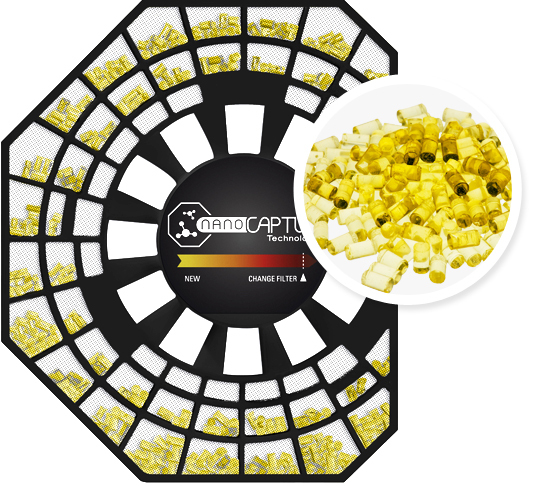 The active carbon filter captures odors, smoke and VOCs. Permanently destroys formaldehyde, the most dangerous pollutant in the home. The HEPA filters stops up to 99.97% of the finest particles.